InterContinental Hotels Corporation was the brainchild of President Franklin D. Roosevelt and Pan Am founder, Juan Trippe. FDR was the first American President to fly overseas, and he did so on Pan Am’s fabled flying boat, The Dixie Clipper. In 1943, Roosevelt traveled to the Casablanca Conference to meet with allies Winston Churchill, Charles de Gaulle, and Josef Stalin to discuss strategy. (Stalin backed out at the last-minute.) Roosevelt must have been impressed with Pan Am’s service because he decided that Trippe was the man to execute an ambitious post-war plan. 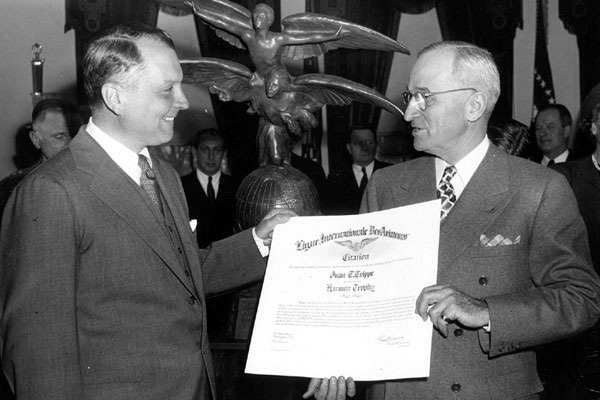 President Harry Truman presents Pan Am President Juan T. Trippe with the Harmon Aviator Trophy, 1946. Photo courtesy of Pan Am Historical Foundation, www.panam.org/, no copyright infringement intended. With the end of WWII in sight, FDR and Trippe met in 1945 to discuss the need to bring new business and economic development to Latin America. Pan Am had pioneered service to the continent with Trippe and Charles Lindbergh piloting exploratory flights in the 1930s. Pan Am’s subsidiary, Panagra (Pan American Grace Airways), a joint venture between Pan Am and the Grace Shipping Company, had been operating in Latin America since 1939. But while air service was growing, there were many places where accommodations were very limited. 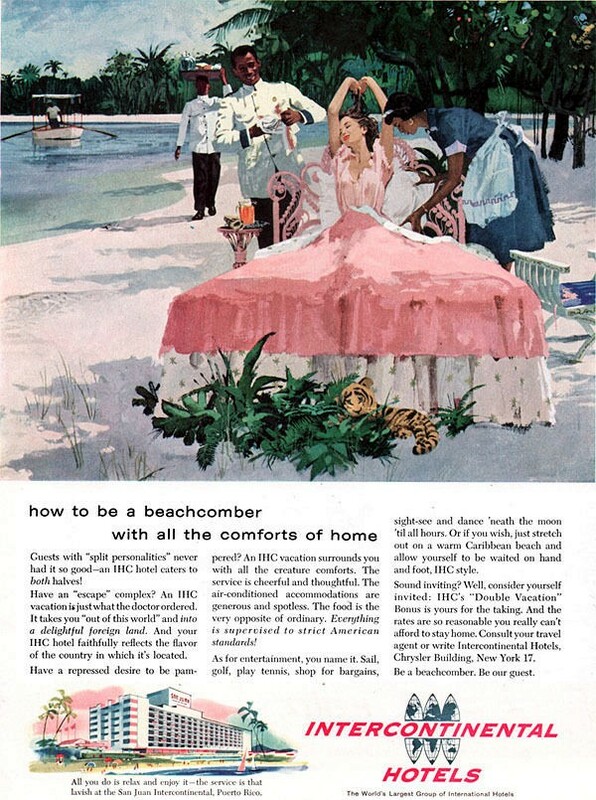 Pan Am built guest houses in some areas of the Caribbean and Latin American to accommodate passengers and crews. Trippe was set to order new and larger aircraft and they would not be filled if there were no lodgings for weary travelers. FDR and Trippe concluded that one way to spur growth would be to build luxury hotels for business travelers and tourists. Trippe agreed to form a subsidiary to investigate the feasibility of the venture, and FDR provided government support from the Export-Import Bank. 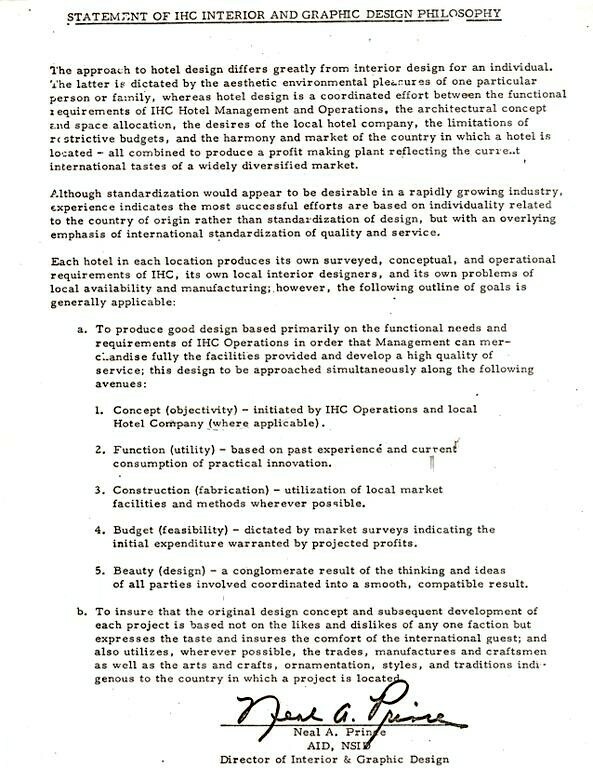 On April 3, 1946, InterContinental Hotels Corporation was formed. 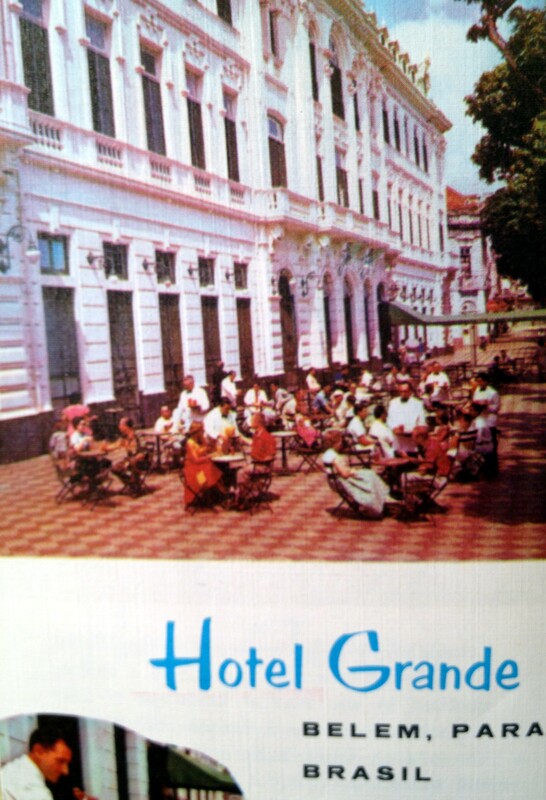 InterContinental’s first hotel was the Grande built in Belem, Brazil, a port city and gateway to the Amazon. Photo reprinted with permission from the Neal A. Prince Special Collection & Archives, New York School of Interior Design, New York, New York 10021. The first hotel opened in Belem, Brazil in 1949. Hotel Historian Stanley Turkel describes the hotel’s laundry – in a courtyard with 20 laundresses washing clothes by hand and pressing them with irons loaded with hot charcoal. 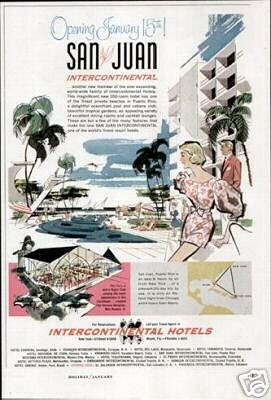 By 1953, InterContinental Hotels had doubled in size with hotels in Bermuda, Bogota, Montevideo, Mexico City, Santiago, Barranquilla, and Caracas. 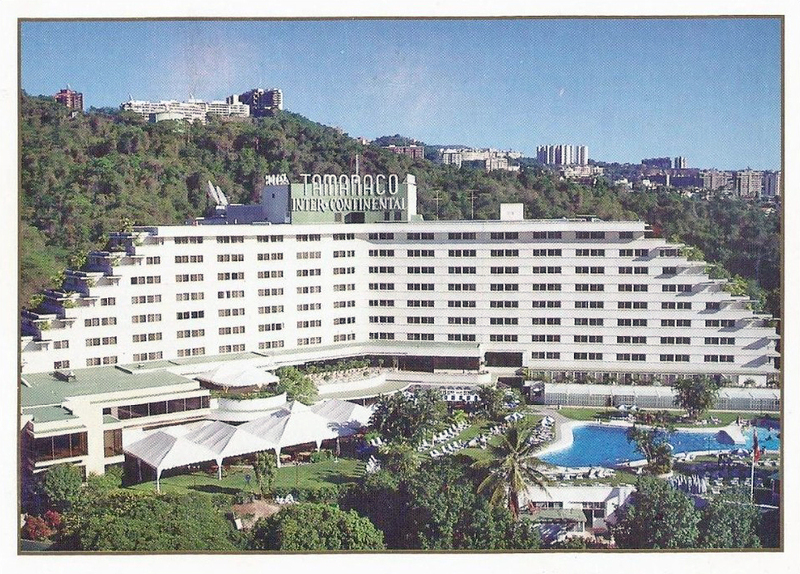 By 1954, the IHC hotels built in Latin America, such as the Tamanaco InterContinental, featured air conditioning, a luxury not found in many hotels at the time. Named after a Venezuelan tribal chief, the Tamanaco, high on a hilltop overlooking Caracas, welcomed Miami and New York crew members for three decades and is still under the InterContinental banner. Inspired by an Aztec pyramid the InterContinental Tamanaco in Caracas was one of the first hotels in Latin America to feature air conditioning. Photo reprinted with permission of the Neal A. Prince Special Collection & Archives, New York School of Interior Design, New York, New York 10021. Reprinted with permission of the Neal A. Prince Special Collection & Archives, New York School of Interior Design, New York, New York 10021. 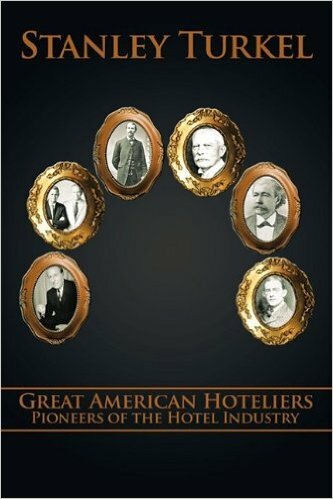 In his book, Great American Hoteliers: Pioneers of the Hotel Industry, historian Stanley Turkel places Juan Trippe on a par with such American hotel giants as Conrad Hilton, J. Willard Marriott, Ellsworth Statler and Howard Dearing Johnson. But as Turkel notes, Trippe – his eyes on the skies – proved a reluctant hotelier. He made several efforts to persuade the heads of established hotel brands to take over the project, but they considered the required investment too costly and the territory unknown. However, Trippe realized that Pan Am’s successful global expansion demanded safe, clean, and comfortable Western-style accommodations. 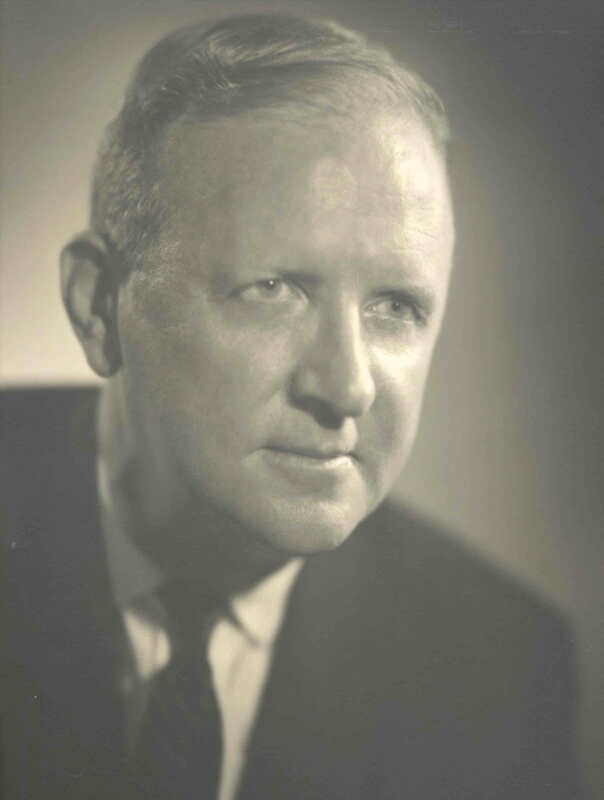 He set about building a world-class hotel company, and Pan Am and Juan Trippe became legends in American hospitality. 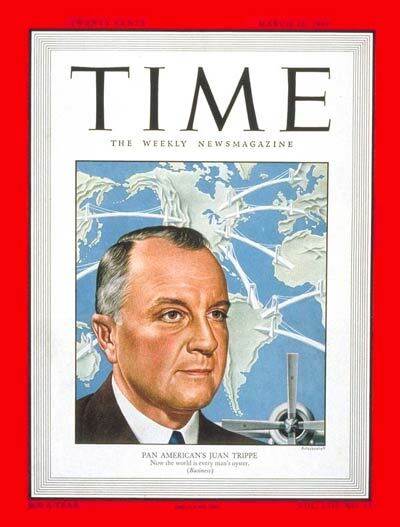 TIME Magazine ran its second cover story on Pan Am founder Juan Terry Trippe and his company’s global expansion, in 1949. That same year, InterContinental Hotels Corporation, the brainchild of Trippe and President Franklin Delano Roosevelt, opened its first hotel in Belem, Brazil. The magnificent El San Juan InterContinental was situated on its own luxurious, fifteen-acre tropical estate in Puerto Rico. Reprinted with permission from the Neal A. Prince Special Collection & Archives, New York School of Interior Design, New York, New York 10021. InterContinental Hotels were built to high standards and often provided the only luxury accommodations in far-flung cities. Guests were assured of fine (and sanitary) restaurants, Western plumbing, working telephones, comfortable beds, and amenities such as swimming pools, hair salons, upscale shops, dry cleaning, concierge service, and banquet facilities. The hotels were also organized to assist business travelers in an era when communications were limited, especially in developing nations. Forerunners to the Business Centers found in today’s hotels, IHC offered assistance in making appointments, finding translators, placing overseas calls, sending telexes, and booking flights and ground transport. But standardization ended there. InterContinentals were far from cookie-cutter properties. Each hotel reflected the culture and art of the host country in every aspect of operations: food and beverage, architecture, artworks, furniture design, fabrics, table settings, landscaping and staff uniforms. IHC not only respected and celebrated local culture, but it also provided work for artists and craftspeople as well as hotel jobs and training for numerous residents. For example, the award-winning design of the Siam InterContinental was based on the sweeping roofs of Bangkok’s temples. Thanks to close collaboration between the architects and InterContinental’s design team, headed by noted interior designer and architect, Neal Prince, the hotel reflected the exotic past of old Siam in a stunning contemporary setting. Guests were greeted in a sky-lit lobby with beams of teak, accented by dramatic artworks and intricately carved furniture upholstered in vivid Thai silk. When the hotel opened in 1965, Buddhist monks officiated and installed a charming Thai Spirit House on the grounds, to attract good spirits and keep the Siam InterContinental Hotel safe from harm. The orange towels in the bathrooms were inspired by the monks’ saffron robes, and they became standard issue in IHC bathrooms worldwide. Sadly, the iconic hotel was torn down in 2002 to make room for a shopping mall. Meet Me At The InterContinental! Three days in the sweltering weather in each direction. The only relief was at 6 PM when the Amazon Bar opened – Air Conditioned! While we waited at the door we studied the life sized statue of an Amazon warrior, with the right breast removed to clear way for the bow string. Cold beer! I was flying for Pan Am in 1986 and engaged to my now hubby. We had a layover in Vienna at the Intercontinental. When the desk clerk learned that I was with my finance’, he gave us a corner room that had more square footage than our house! Needless to say, my finance’ ascribed to the slogan, “marry me fly free”! Not only that, but stay at the Intercontinental for free WITH me! !